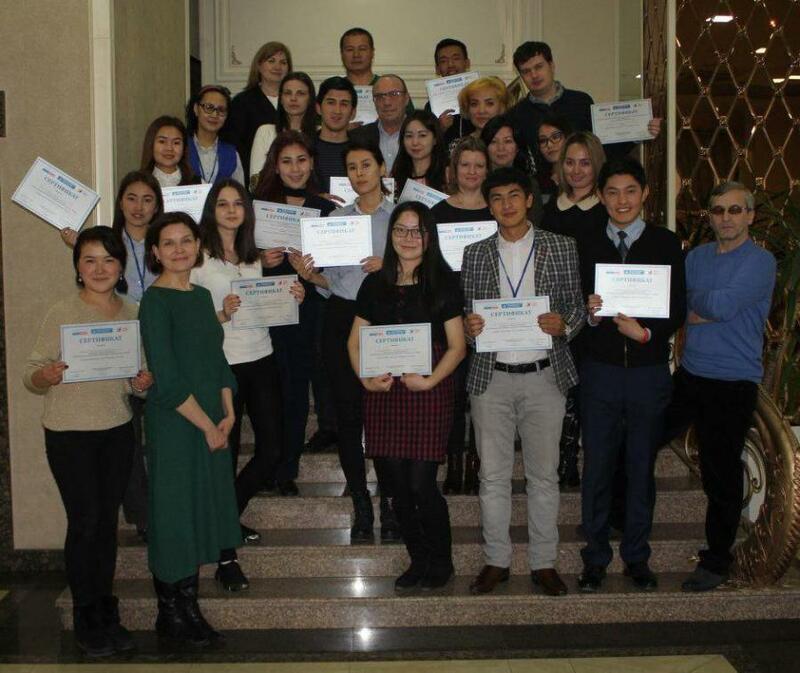 25 journalists and media workers from various regions of Kyrgyzstan have been trained to counter the propaganda of violent extremism and hate in the media. 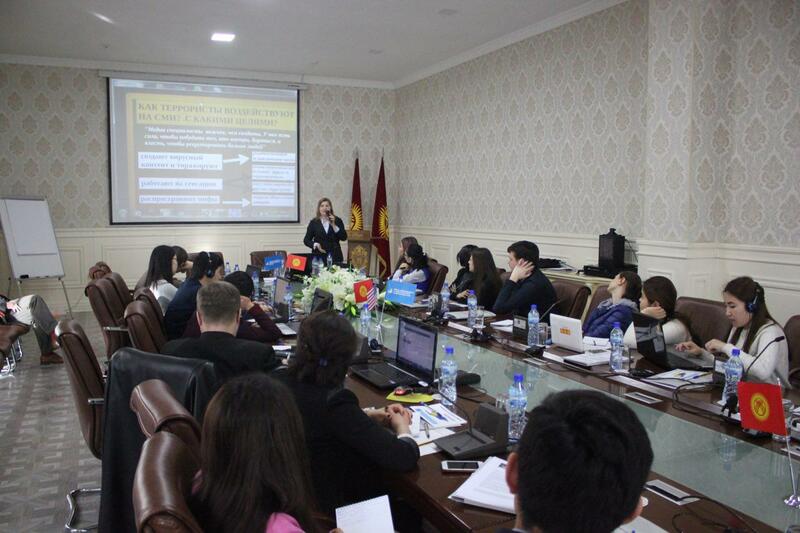 The training programme was developed by a team of local and international trainers based on the findings of the media-monitoring sphere of Kyrgyzstan and with the use of new interactive tools. The participants have learned about the media used by banned groups to spread extremist propaganda, the mistakes made by journalists and users that lead to the propaganda of extremism, how hate speech and Islamophobia affect the radicalisation of the media. A few sessions have been dedicated to the key aspects of religious safety of Kyrgyzstan, legal standards of international laws on violent extremism, radicalism and terrorism, communication’s methods between official bodies and media outlets when covering security issues. On the last day, a presentation of handbook "How to counter extremist propaganda” in Kyrgyz and Russian developed by the project experts exclusively for the media outlets was delivered. The handbooks have been given to the media in Osh, Jalal-Abad, Batken regions and Bishkek, as well as to the universities to the departments of journalism and communications. 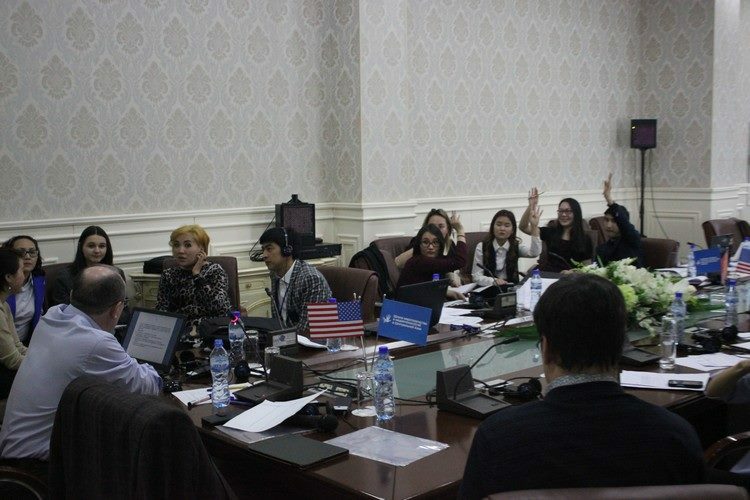 The two-day training-workshop was organised by School of Peacemaking and Media Technology in CA under the "Combatting Violent Extremism Through Media and Awareness’ Project implemented with the financial support of the US Embassy in Bishkek. Inga Sikorskaya works as the Director of School of Peacemaking and Media Technology in Central Asia from 2012. She is a professional journalist, media expert and trainer. Her areas of expertise include freedom of expression, peace study, hate speech, diversity and language rights, conflict and ethnic journalism. Inga is the founder of the School of Peacemaking & Media Technology in 2010 after then she found herself in the center of the ethnic violence in the southern Kyrgyzstan and has made a numerous media reports and photos from the conflict zone. She initiated the constant media monitoring for hate speech, that until then was not in Kyrgyzstan and adopted research methodology based on international experience. Combating Hatred in Social Media – Exploring Interrelations with Freedom of Opinion and Expression to develop recommendations at the OSCE Chairmanship Conference on Tolerance and Diversity in Germany in October 2016. She comments regularly on freedom, hate speech, conflict and media issues for the Radio Liberty, IWPR, other media and conference, and has been heavily involved to creation of the post-conflict policy in Kyrgyzstan. Mrs. I.Sikorskaya is the author of more than50 analytical reports for the British Institute for War and Peace Reporting (IWPR),where she spent seven years as a senior editor for Uzbekistan and Turkmenistan, the most closed countries in Central Asia. Previously Inga worked in Kyrgyz TV and radio. In 2015 she joined on research project for the organisation Peace Direct that funds and promotes local peacebuilding in conflict regions around the world. Inga’s role is of Local Peacebuilding Expert in Kyrgyzstan, she conducts research on peacebuilding, writes information on peacebuilding organisations and its analysis the approaches and cases which can be read the website. In 2012-2013 she has been to Afghanistan, where she made a series of photo essays on "the back of the war” and create ​​the hand book entitles "How can women journalists make visual reports from Afghanistan". Besides she was one from an author of the handbook "Effective Communication" and "The Human Rights Reporting" for journalists and activists in Central Asia, co-author investigation "Health in Turkmenistan after Niyazov” at the London School of Hygiene&Tropical Medicine. In 2015 Inga developed the firstonline course for journalists and activistsin Kyrgyzstan and Central Asia on how to cover ethnic, cultural and linguistic diversity in time of peace and conflict. She holds B.A. in Mass Communications and Journalism and M.A. in Law. 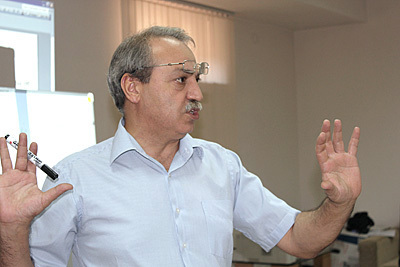 Arif Aliyev joined School of Peacemaking and Media Technology as a trainer in 2011. He is professional journalist, has got rich experience in the media industry.Having become a member of the expert team of the School, he has developed a number of original training methods to destroy stereotypes of journalists and media editors in southern Kyrgyzstan. 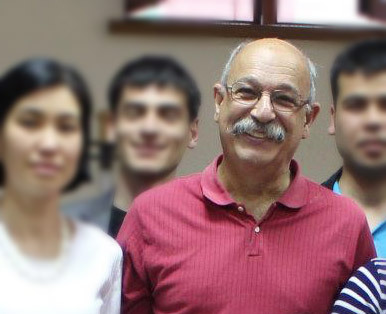 He specializes in peacemaking and ethnic journalism, is the chairman of the "Yeni Nesil” union of journalists Azerbaijan. Arif is also the initiator of the Baku Press Club project and the Press Council of Azerbaijan. Arif is a founder of the prestigious in the country journalism award "Key media." He is an author of more than 830 nonfiction works in newspapers and magazines, television and radio - broadcasts, documentaries, author and compiler of 14 books. Eran Fraenkel is a specialist in the field of media and social change. International trainer on peacemaking journalism joined School in 2012, when he has successfully trained multinational group of reporters from southern Kyrgyzstan on production of reportage at post conflict area. New concept of journalism for Kyrgyzstan previously has been successfully applied during such a project in Macedonia in the Balkans, in the post-conflict period. In the framework of his activities Eran trained Kenyan youth and community groups to the development of programs of the media to conflict transformation. He led the team that conducted the evaluation of the media in Afghanistan, and worked as the lead author of the "Afghanistan: assessment of media opportunities to build peace" report published by the U.S. Institute of Peace in 2010. Fraenkel has developed a program for the training of young radio journalists in Aceh, Indonesia, and a new program to assess the media in conflict regions. Ashot Melikyan joined the trainers’ team of the School of peacemaking and Media Technology in 2011. With rich experience in the reporting on ethni conflicts, peacemaking and establishing peace between the warring parties, he is one of the developers of training materials for the training of journalists in southern Kyrgyzstan. This technique is based on the experience gained by reporters and media organizations of Armenia and Azerbaijan in the implementation of joint projects. Beginning in 2011, the technique was successfully implemented in the training course of the School of Peacemaking and Media Technology. Ashot was a professor of journalism at the University of Yerevan, was the director of the Media Association and coordinator of the Yerevan Press Club. 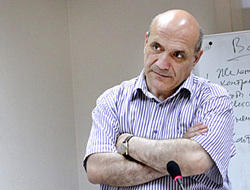 Currently, Ashot Melikyan is a chairman of the Committee on Freedom of Speech in Armenia. 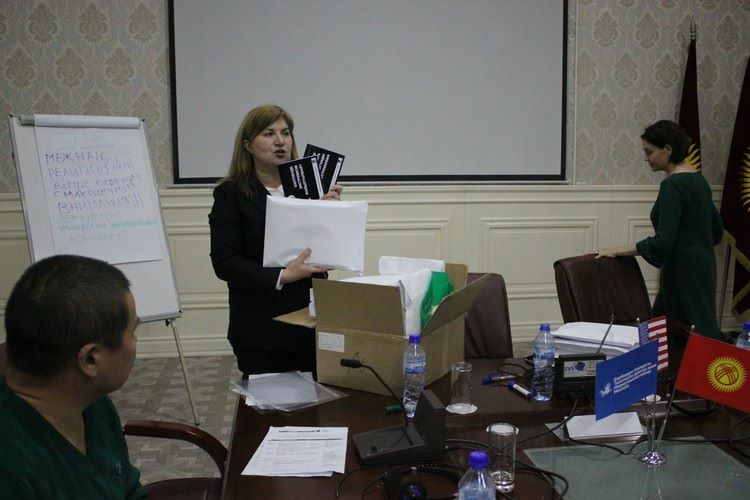 peacemaking trainings conducted by School for participants from Kyrgyzstan and Uzbekistan in 2010. His training skills are certified in the Kennedy School of Government, Harvard University of the USA, Conflict Management Group in Cambridge in the USA, and his techniques on the destruction of stereotypes and the elements of the effective negotiations are being used by activists and journalists in Kyrgyzstan so far. His methods of teaching at the mediation were successfully tested in the post-conflict period in Armenian and Azerbaijani communities. Tevan is also executive director of the International Center for Human Development in Armenia, included in the list of the top 25 brain trust centers of the countries of Central and Eastern Europe. At the end of the nineties, Pogosyan was the representative of the Nagorno-Karabakh Republic in the USA, and in 2012 he became a member of the National Parliament of Armenia. 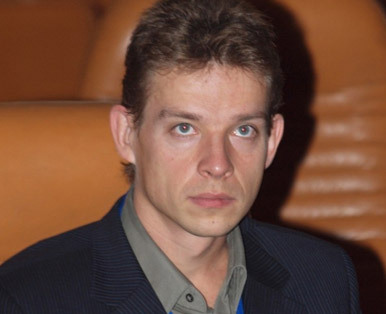 Vyacheslav Likhachev is an expert in the area of the ethno-political conflict solving, xenophobia on the post-Soviet spacepolitical extremism, the theory of nation and nationalism. He joined the team of experts of the School of Peacemaking and Media Technology in 2012. Vyacheslav deals with developing of training methodologies on media monitoring tools to identify the hate speech and conflict-prone attitudes for School, and conducts webinars on the ways of avoiding hate speech in public discourse. Likhachev also runs a program for monitoring and analysis of xenophobia Congress of National Communities of Ukraine, is the author of several books, 300 articles and more than 60 scientific publications.